Are you surprised? I thought “Flexible work schedule” and “Great boss” would receive more votes than they did. 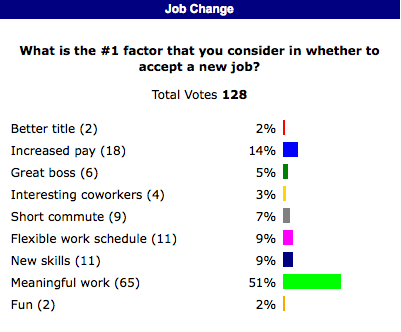 If you are a hiring manager and you are hoping to attract new talent, now you know what matters most to job seekers! Dr Janet, This is a really interesting finding and thanks for sharing. When I ask clients why they want a change, they would also mention that they felt that their work wasn’t recognized by their superiors, and that they were not appreciated for the extra effort they put into their work, were those comments coming through with your research too? This might just be a preference requested by the Australian work force. Bonnie, the survey didn’t include an option such as, “Seeking more recognition/appreciation for my work,” but it probably should have! That would be a good one for me to add in future surveys. We are lucky enough in the Western world to be able to find work quite easily. This is why everyone gets to a stage where work has to serve a larger purpose than to just make money.